We have nearly completed Phase 1 of our building process just in time for our 50th Anniversary, and CRO dedication. We have a little carpeting to do, and some minor details, but it is looking great!. This part was the first step in getting the land into a usable condition for a productive place to observe. This included the following steps. Installation of a building to serve as a warm-up room in winter, and location of restrooms. Six 10ft. x 10ft. observing pads have been poured and purchased. A Nice Comfy Spot to. See the whole gallery of the building construction here. Phase 2 is the installation of a permanent telescope to be used for research and public viewing. We have on permanent loan from the University of Oklahoma, a 12" Classical Cassegrain telescope on a German Equatorial Mount. We have completed the process of getting that installed on the South side of the building, and constructing a roll-off roof shelter around it. First light in its new home. 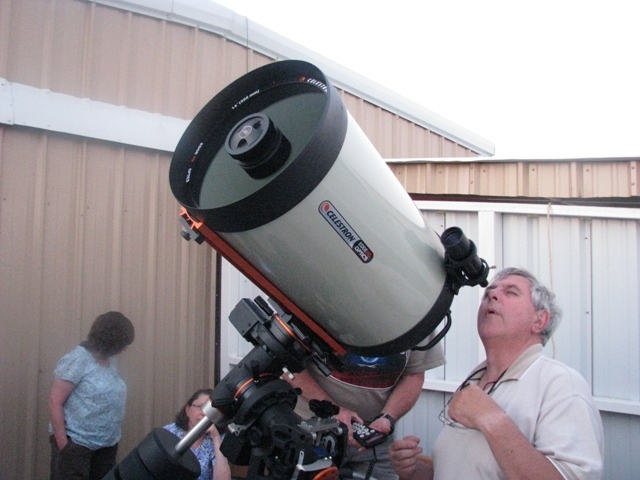 Around the middle of May, Jeff Thibodeau was contacted about a 32" Newtonian telescope for sale. This telescope would make a fine addition to the 12" OU telescope, and would broaden the amount and type of research that we could accomplish. After discussion with fellow board members, Jeff released this press announcement requesting a gracious benefactor that would help us in the purchase of this scope. 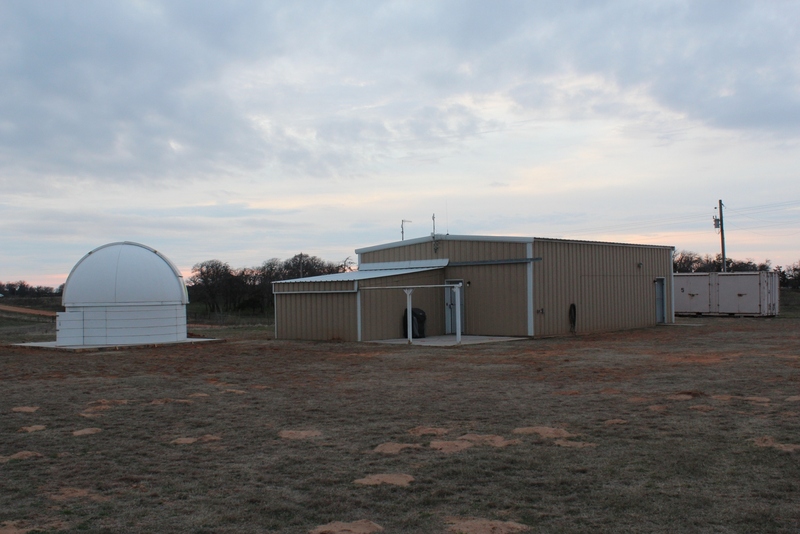 The Oklahoma City Astronomy Club is only weeks away from dedicating a new general purpose building, funded in part by the Kerr Foundation, southwest of Watonga. Work on the Cheddar Ranch Observatory project has kicked into high gear since January with the construction of a classroom/library and general use structure. This purpose of this facility is astronomical education, scientific research and regularly scheduled evenings when the public will be invited to come look through telescopes under the dark skies of rural Blaine County. One of the goals of the Oklahoma City Astronomy Club has been to provide a complex where elementary age students could learn the sky and high school and university students could participate in real research. 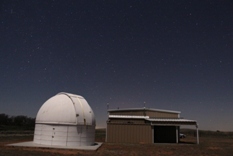 As a result, the University of Oklahoma has placed a 12-inch diameter telescope on permanent loan with the club to be operated on site. 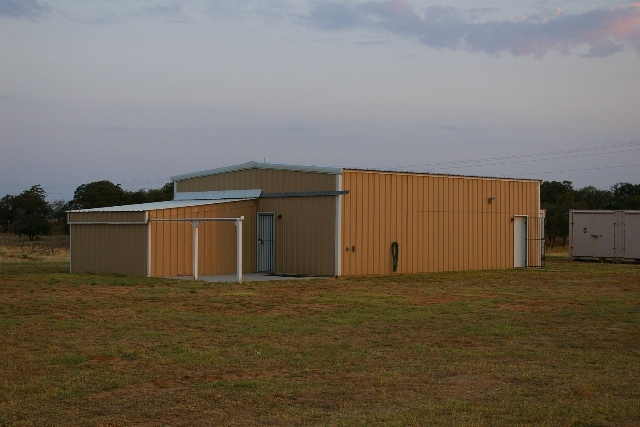 More recently, the club has been given the opportunity to acquire what would become the largest telescope in Oklahoma, a 32-inch diameter reflector of excellent quality. The optical system of this telescope was crafted by the Chief Optician for the Hale Observatories (Mt. Wilson/Mt. Palomar) in California. This large, high quality telescope will give generations of students an opportunity to learn about celestial objects first hand. It will provide spectacular views of the heavens for anyone who chooses to come out and look and it will be a point of civic pride for all of western Oklahoma. 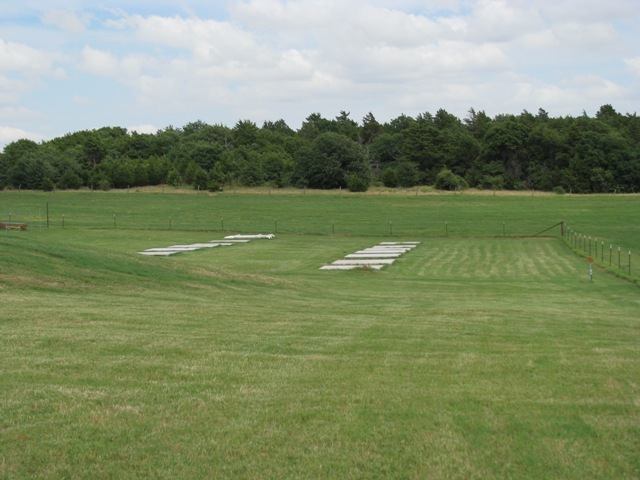 The site of Cheddar Ranch Observatory was a gift of the McCrary family of Watonga. Since all of the club�s resources have been poured into property improvement, they seek a benefactor who would be willing to help with the purchase of the 32-inch telescope. Estimates to acquire and house this instrument are in the $30,000 range. The Oklahoma City Astronomy Club is a 501(c)(3) educational and scientific organization and donations are tax deductible. Contact the Oklahoma City Astronomy Club at P.O. Box 22804, Oklahoma City, OK 73123-1804. www.okcastroclub.com. The coveted 32 inch telescope was, unfortunately, sold before the club could raise the money for purchase, so we will continue to look for avenues of revenue to bring a major scope to Oklahoma. In the meantime, while the OU telescope is a fine instrument, it is not compatible with most modern accessories. Therefore, in the summer of 2012, the board encumbered funds for the purchase of a new telescope for the roll-off roof observatory. Through generous gifts from Dr. Bill Romanishin, Roger Lindley, and a grant from the Kirkpatrick Foundation of Oklahoma City, the club has mounted a new Celestron Edge HD 14 inch Schmidt-Cassegrain (C-14) telescope in the roll-off roof observatory. The telescope has greater light-gathering capacity than the 12 inch traditional Cassegrain and it has the ability to be converted into a wide-field sky camera. The C-14 is mounted on a new Celestron CGE Pro German Equatorial Mount with �goto� capability so virtually any celestial object may be selected from the data base and the telescope automatically �goes to�, centers, and holds that object in its field of view for study by eye or camera. Since the C-14 is also Fast Star compatible, we will be able to use it in either the long Cassegrain focus or the short prime focus with a video camera to project the image. Plans are in the works to add video capability so that groups will be able to see celestial objects on a television monitor without having to wait in line for individual views. The view below shows CRO as it is today, complete with warm-up and observatory building that includes Wi-Fi. There are now Twenty-two 10ft x 10ft observing pads.